Baby Shower is one of the best things that happen to a couple’s life. Decorating for a baby shower is just like a dream come true. It is one of those biggest events that have been praised even in the fairy tales. Baby shower, especially for the expectant or delivered baby’s. It is one of the special events where the mother of the baby is presented with some of the surprising gifts that makes her day more memorable. We are here with best baby shower balloon decorating ideas that can make your baby shower, a life-changing moment. It is one of the best ideas to establish a warm and loving ambiance. You don’t have to actually decide a theme for the baby shower Just buy some attractive decoration material from the market. Traditionally, expected parents used to guess the gender and then decorate the baby shower accordingly. But nowadays, things have changed. Traditionally, most of the baby shower was gender-specific, but not both a girl and a baby boy is welcomed equally. Choose attractive decorative material that can go with both the girl and the boy. You can buy some toys, stickers and use pastel colors to decorate your baby shower area. Let the expecting mother know that you care. When guest and the near ones give a gift to the expecting mother, do not forget to wrap the gift in colorful paper. Leave it on a table and let the mother open and embrace the love that the guests want to share with her. Traditionally, it was said that the expectant mother room should be decorated all the time so that she could feel the happiness around from within. This will help her to send the positive vibes to the baby as well. Decorate her room using some colorful material like balloons, nice and smiling baby photos, cute cartoon characters, and other things. Decorate the center table where the expectant mother would sit with the help of red roses. This is rather an old tradition that means the mother and the baby would be protected and guarded by evil forces. It is believed that there should be 16 dark red roses on the table. If you have planned to play some games during your celebrations, then you can use these roses as a kind of gifts for the winners.
. If you have planned to give a buffet, then do not forget to decorate the buffet area as well. It is advised to keep only vegetarian food as non-vegetarian food may harm the mother and the bay both. It is better to avoid the junk food also and you can include more of food for kids when you finalize your menu. 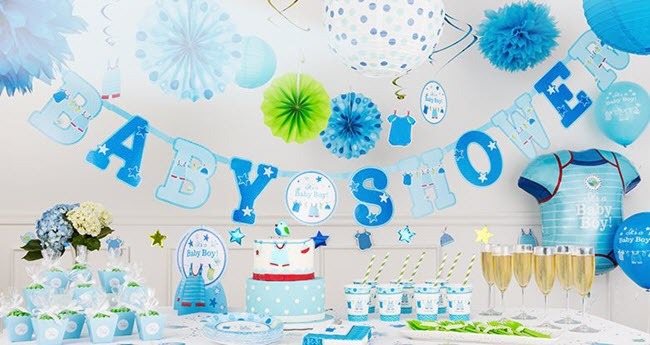 Above are five decorative tips for a great baby shower. Babies are the gift of God. So, the baby shower shouldn’t be categorized and biased. Both a girl and a boy should be welcomed with the open heart.